In the past 1,5 year I have been playing a bit with Home Automation (or Domotics / Domotica) systems. I initially bought the HomeWizard, but was pretty disappointed in it. When the HomeWizard domotica system was introduced I expected a lot of it, sadly enough it has not been as great as I hoped and I am currently moving over to another system. One of the things that annoyed me of the HomeWizard is the inability to add other sensors to the setup which were not part of the supported hardware (which is pretty limited). 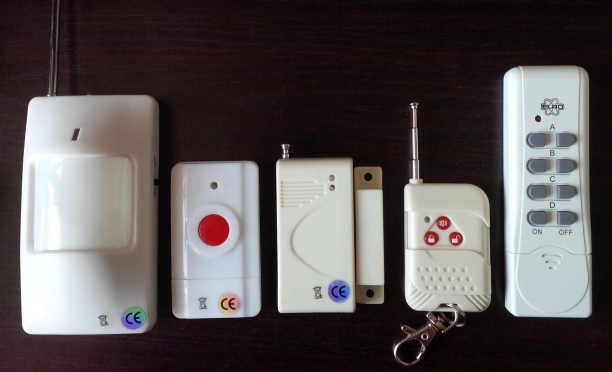 I moved to the HomeWizard from a different (alarm) system which contained a lot of 433Mhz sensors which I could not hook up to the HomeWizard. Because I did not want to throw all these sensors away I built a middle-ware system with an Arduino and some code which can convert the non-supported codes in to HomeWizard supported codes (KaKu / CoCo style codes). The middle-ware receives a code and then translates that to a code which can be understood by the HomeWizard. Initially designed for usage with HomeWizard this same approach also worked with HomeSeer, Domotiga and Domoticz, which all did not support my sensors directly (most of them because of the usage of the RFXCOM). The approach described is shown in the overview below (the numbers used are just examples). The hardware used for the middle-ware is a standard Arduino (or cheap alternative such as this), with an Arduino shield and a basic 433Mhz transmitter/receiver set. Any basic 433Mhz receiver and transmitter can be used for this, such as this pair on DealExtreme. The receiver module is the longer board of the two, the transmitter is the small one. The shield can of course also be replaced with a small breadboard, if that is what you prefer. The following picture shows the setup of the Arduino and the 433Mhz sensors (green, receiver at the top, transmitter at the bottom), the red wires are the 5V wires, the black wires the GND wires and the blue wires the DATA wires. The antenna positions on the 433Mhz boards I used are shown by the A’s. To extend the reach of the 433Mhz transmitter and receiver I added two antennas to the setup, made out of 16,7cm copper wire. I reinforced the antennas with the plastic part of cotton swabs (q-tips / wattenstaafjes (Dutch)) and some heat-shrink tubes, which worked out pretty well. The finished product can be seen below. 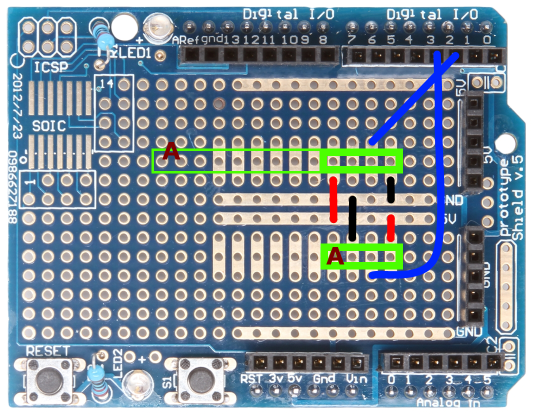 The simplest code to run on the Arduino can be found below. This code makes use of two very nice Arduino libraries written by Randy Simons, it actually leans fully on those libraries and only links them together. Feel free to do whatever you want with the code below, only keep in mind the license of the libraries used. 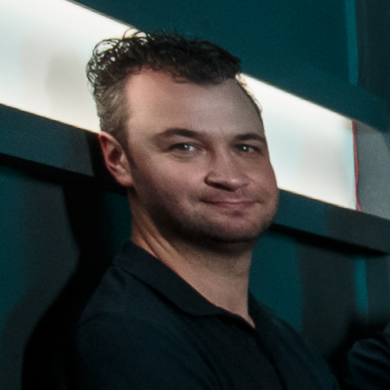 Any fixes or additions to the code are of course welcome, so please let me know if you have any. This code sends out the same code it received, it is only converted to the other protocol. That way any 433Mhz device it picks up will be forwarded. This is the easiest way to add multiple 433 Mhz sensors to your setup. However, you can also choose to use the more advanced code below, which enables you to define your own codes and only forwards the codes it knows. This might be a solution you want when there is a lot of interference from other devices you do not want to have added to your system. This code below also has a debug option which shows you which 433Mhz codes are seen by the Arduino, which might be helpful to find the codes for all your devices. Since the middle-ware is now sending out KaKu/CoCo codes that the HomeWizard can understand we can add them to the HomeWizard. Since we use a very simple protocol here we can at this moment only add the sensors as ‘Doorbells’, but that should not limit you in using the sensors. When the Arduino middle-ware is being used the sensors will start showing up in Domoticz when the RFXCOM picks them up, they are shown as using protocol Lighting 2, AC. 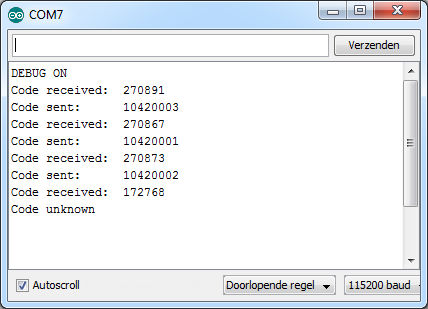 When linked they will also show up in the log file (in this example they are linked to an event which sends out notifications using NMA). After writing this How-To I decided to make a new version which could do two way communication. Which means you can use the Home Automation system to control your cheap 433Mhz receivers (such as ELRO power adapters) as well. This has been successfully tested on ELRO AB440SC (433.92Mhz) Wireless Switch Units. 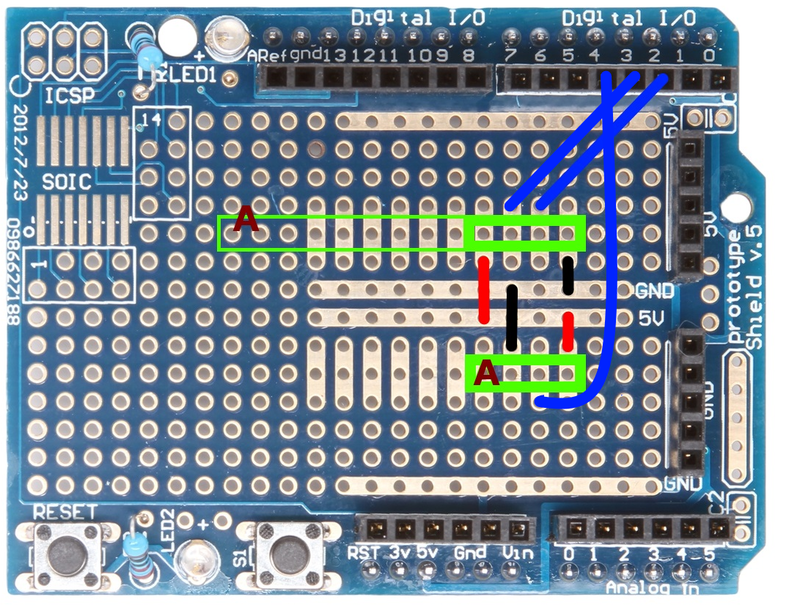 The Arduino schematic for this Two-Way version is shown below, because the Arduino interupts 0 & 1 are on digital pins 2 & 3 we need to move the sender to digital pin 4. We hook up the same receiver to both PIN 2 and PIN 3 (both of the middle pins in the receiver are DATA). I hope this approach might be of use to someone. Please let me know if you have additions, remarks or comments. As last I would like to thank Randy Simons for his great library which enabled me to create this in a fairly simple way. 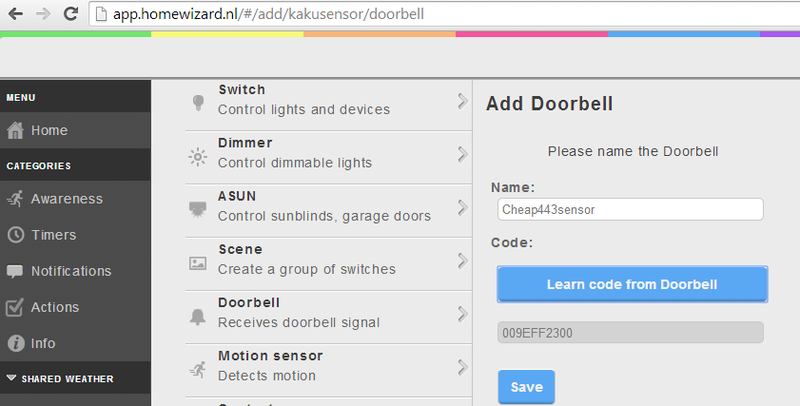 Thijs, I’m looking into hooking up some RF door sensors to a Raspberry Pi connected to OpenHAB. I’m having trouble finding info on the events which I can capture with this. I’d like to capture both a door-open and door-close event in order to reliably determine the door state. This would require the sensor to send two different codes (one for open and a different one for close). Do you know if there are any sensors that do this? Or do they only send a door-open event (as this is the only relevant event for for alarm systems). However, KaKu is a bit more expensive. Is there a way to use another sending protocole ? Depends on what kind of protocol you want, as long as it is 433Mhz and there is a module for it you can. However if it is a different frequency you will need different hardware. And if there is no module for your protocol you will need to write it yourself. Thijs, sould it be possible to control my blinds with it? They are a NICE 433.92mhz remote with build-in engine receiver. I’m using a homewizard but the homewizard doesn’t support the NICE, only Somfy. I’m not a smart elecro-guy, but i would give it a try. Love the idea. Could it be possible to use this setting to control my screens? They are NICE remote 433.92mhz. I’m using a Homewizard, but because the screens are not Somfy I would have to buy 3 ASUN-650’s to control the screens. If the arduino setup could work, this costs me 1/3 of the price. You could check if the arduino can see the remote signals, if it can it can be done. At the moment I indeed still use the RFXCOM, mainly because I did not want to start coding on Domoticz yet, but you should be able to do it without it. I’m very interested in your work, and built the middle-ware. I now would like to add it to domoticz. So, several questions : How can I do that ? Just plug the arduino’s USB to the raspberry ? Will domoticz recongnize it ? Or is there an other thing to do ? At this time it works as a stand alone middleware communicating to the RFXCOM, however, with some coding you should be able to hook it up by USB. Which adaptions are needed to run these sketches on a Raspberry Pi 3? Is there someone who can sent me this? I used the NewRemoteReceiver library with the program ShowReceivedCode and it works perfectly using homewizard and remote control. I can see the code when pushing remote control, that’s fine. I bought a new 3 remotes control switches from a store called “Action” in France it’s comes from Netherlands manufacturer, I supposed that it worked with Homewizard box but apparently not. It is strange because the code is detected by the arduino program and show the code. additionnaly, the HW box shows the code learnt, but when I ask to HW to send the code to switch on, it doesn’t work, I don’t know why ? Is there anyone able to explain me please ? Could you explain a bit more what you are looking for? These devices are working a bit differently. You have to learn the powerdevices the code. I am no longer using HomeWizard but Domoticz myself, in Domoticz you need to create a new device and then send that signal after the powerdevice is plugged in. You might need to do the same with HomeWizard.